Judge for Lauribeth with "BACK IN SESSION"
Lauri-Beth Quinlivan (born Lauri Beth Preman), daughter of Samuel and Shirley Preman, of Longmeadow, MA. She spent her summers in Nantasket Beach MA. The youngest of four children, Lauri has two sisters, Iris and Randi, and a brother, David. Lauri Beth (LB, for short), began singing at age 3 with her first song being the Don McLean hit, "American Pie", taught to her by her older sisters. At age 4, to the surprise of all, she plunked out the Budweiser theme "When You Say Bud", on the piano. At age 9 LB began acting and voice lessons at the NYC Theater Production Company. She followed up with classes at the Eastern States Acting Company. She also studied dancing for 8 years with Ms. Charmaine Sales (a former NYC Rockette). Discovering the guitar at age 13, LB began to write music. With the help of guitar player Linda Borghesani, also a summer resident of Nantasket Beach, LB mastered her unique style of guitar picking. In 1980, LB was the youngest female student in the history of the Longmeadow High School to be chosen as a member of the select choir Lyrics as well as the vocalist for the schools own Jazz Band. She competed in the Western District and All-State Choir auditions 4 years in a row, and in doing so, achieving the title of youngest singer to sing with an All-State choir. The first official recording of Lauri-Beth's voice was on an album recorded live at Lowell University as an Alto in the Select Allstate choir, in 1982. It was at that time, she began studying voice under the private tutelage of Mr. Peter Thompson. Additionally, LB studied voice and piano with Helen Hubbard at University of Hartford - Hartt School of Music. Lauri-Beth went on to attend Fitchburg State College where she studied Television/Film and Sound Production under the instruction of Producer Elliot Hoffman. While at Fitchburg State, she produced and directed music videos of her own original music, including a song written in memory of the late Beatle, John Lennon. Entering numerous vocal competitions over the years, LB has consistently walked away in first place, taking the First Place Prize (ironically) at the Boston's Budweiser Talent Search Competition. LB has also attended the South Shore Conservatory of Music, where she studied guitar privately with Mark Campbell (guitarist for the well-known, local rock group Clutch Grabwell). To strengthen her already numerous talents, LB began studying Voice-Over Production with Wren Ross of Wren Ross Productions, Boston MA in 1998, and has done numerous voice over spots for television and radio. Post college days, Lauri-Beth began singing for the Leominster, MA based band Daybreak. This project was followed by sharing lead vocals with the North Shore based group Uptown Sound. 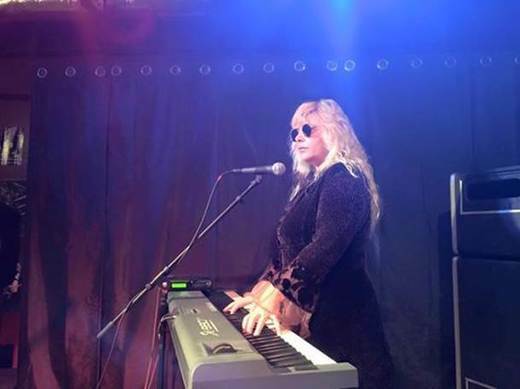 Under the training of "Guitar Dan" in 1994, Lauri-Beth added another feather to her cap and began working as a Disc Jockey/DJ for Dan's entertainment agency, Karaoke Kompany out of Revere MA. After working for three years with Guitar Dan, LB started her own production company, known as "LBS" Productions. Running numerous Karaoke/Dance Music shows throughout New England, LB also trained aspiring DJ's to set up and operate sound systems in clubs to run their own shows. With a growing following, LB had become well known in the Boston area as a local DJ who supported the troops, running weekly shows at the Hanscom Air Force Base Officers and Enlisted Clubs for over 10 years. She also built up a following while running her karaoke shows at Koko Island in Cohassett, MA and fondly remembers the dulcet sounds (and sometimes not!) of all of LB's Karaoke Kids (you know who you all are!) as well as the New Years Eve crowd at Jamie's Pub in Scituate, MA, where LB has been a staple there since 1995. In late 2004 and again early 2006-2013, LB sang lead for the Boston-based Dance/Rock Band "Possession". Lauri-Beth also sang with the South-Shore based Carousel in late 2007 with friends Joe Clapp on Lead Vocals/Guitar, Joe Baglioni on Bass, Gabrielle Heath on Keyboards, Steve Oksenuk on Drums, with Kevin Norris and Steve Morrell on Saxaphone. With the constant support and encouragement of her husband James (Jimmy Q.) Quinlivan (a U.S. Navy retiree), Lauri-Beth worked with Producer Joe Clapp of Ultrasound Productions, Stoughton MA, and released her debut CD in the Fall of 2006, entitled On Angel's Strings - a collection of songs written by Lauri-Beth for classical acoustic guitar, including a song about a dream she had being held in the arms of an angel. Lauribeth is currently recording some cover songs and new dance-era originals at Ron Bosse Studios in Weymouth MA. In August 2013, Lauribeth and several members of the band Possession, along with a core group of musicians from another local band, The Infractions, have come together to form "BACK IN SESSION" and are scheduled to debut at the Great Chow in Abington MA on 10/26/2013.